The integrated assessment models described in previous sections estimate the carbon emissions that result from a given scenario of economic development and population growth. These emissions are then converted into atmospheric carbon dioxide partial pressures using reduced-form carbon cycle models. In the flip side to these emission scenarios, the stabilization scenarios calculated by the integrated assessment models also make use of the reduced-form carbon cycle models, but now to calculate permissible emissions, which are then translated into an energy supply from fossil fuels. The aim of this section is to examine how uncertainties in the global carbon cycle might affect both the growth rate in atmospheric carbon dioxide that results from a given emission scenario and the permissible emissions that result from a given concentration stabilization scenario. We begin our discussion with the set of stabilization scenarios shown in Figure 4.9 and a detailed breakdown of two stabilization scenarios given in Table 4.3. Because of the dependence of asymptotic atmospheric carbon dioxide on cumulative rather than annual emissions, annual carbon emissions have to peak and eventually decline well below present levels (Figure 4.9a) in order to stabilize cumulative emissions (Figure 4.9b) and thus atmospheric CO2. This is true irrespective of the stabilization target. Note, however, that a considerable amount of emissions can continue for many decades and even centuries beyond the peak, as the deep ocean gradually comes into play as a carbon sink. A range of processes determine carbon uptake by the ocean and the terrestrial biosphere (Prentice et al. 2001; see chapters by Friedlingstein, Le Quéré and Metzl, and Greenblatt and Sarmiento in this volume) and thus allow carbon emissions for a given stabilization pathway. Factors that influence oceanic and terrestrial storage are the increase in atmospheric CO2, the increase in radiative forcing by CO2 and non-CO2 greenhouse gases (GHGs) and other agents, the sensitivity of climate to radiative forcing, and the sensitivity of carbon cycle processes to climate change (Joos et al. 2001; Lee-mans et al. 2002). Terrestrial carbon storage depends on past and future land use (Hurtt et al. 2002; Leemans et al. 2002; Gitz and Ciais 2003), the sensitivity of soil respiration to soil temperature and moisture changes, and changes in structure and distribution of ecosystems (Cox et al. 2000; Cramer et al. 2001; Joos et al. 2001). The role of increasing atmospheric CO2 and of additional nutrient input into terrestrial ecosystems (Townsend et al. 1996) in enhancing primary productivity remains controversial. Recent reviews (House et al. 2003; Houghton et al. 2003) discuss the conflicting evidence for environmental growth enhancement (see also Hattenschwiler et al. 1997; Luo et al. 1999; De Lucia et al. 1999; Caspersen et al. 2000; Joos et al. 2002; Cowling and Field 2003). Figure 4.9. 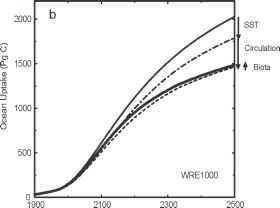 (a) Allowed carbon emission for the WRE 550 pathway where atmospheric CO2 is stabilized at 550 ppm (dot-dash line, right axis) as simulated with the Bern CC model (Joos et al. 2001). The model's climate sensitivity, expressed as equilibrium temperature increase for a doubling of atmospheric CO2, has been varied between 0°C (no climate feedbacks, dash), 2.5°C (standard case, solid), and 4.5°C (long-dash). 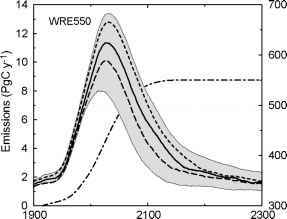 The gray band provides an estimate of the overall uncertainty of the allowed emissions. The lower bounding has been calculated by phasing out CO2 fertilization, the major terrestrial sink process in the model, after year 2000 and by setting slow ocean mixing rates. The upper bounding has been obtained by implementing no dependence of soil respiration rates on soil warming, thereby suppressing the major terrestrial source process in the model and by setting high ocean mixing rates. 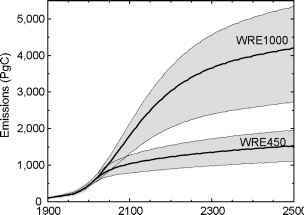 (b) Cumulative carbon emissions allowance for the two WRE stabilization pathways leading to stabilization at 450 ppm and 1,000 ppm. influence the oceanic uptake are a slowing of the circulation in response to changed heat and freshwater fluxes into the surface ocean, and changes in marine ecosystems and their productivity in response to changes in the physical and chemical environment (Maier-Reimer et al. 1996; Sarmiento et al. 1998; Joos et al. 1999; Matear and Hirst 1999; Plattner et al. 2001). Uncertainties in projections are thus associated both with uncertainties in basic carbon cycle processes, such as the rate of surface-to-deep mixing of excess carbon or fertilization mechanisms on land, and with uncertainties in carbon cycle—climate feedbacks, including a possible collapse of the formation of North Atlantic Deep Water or dieback of extant forests. In the following sections, we explore these uncertainties in a quantitative framework, using primarily sensitivity studies that have been carried out within the framework of IPCC with the Bern carbon cycle-climate (CC) model (Joos et al. 2001; Prentice et al. 2001), but also including recent results from two three-dimensional Earth system models (Cox et al. 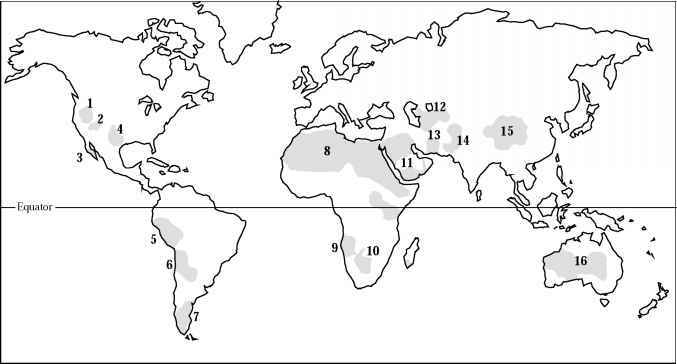 2000; Friedlingstein et al. 2000). The Bern CC model links a chemistry and radiative forcing module, the HILDA box-diffusion-type ocean model, the Lund-Potsdam-Jena (LPJ) dynamic global vegetation model (Sitch et al. 2003), and a substitute of the ECHAM3/LSG AOGCM. The three-dimensional models are computationally expensive, and simulations are not available for the stabilization scenarios. Figure 4.9 and Table 4.3 illustrate how uncertainties might affect estimates of emissions for various stabilization scenarios. The cumulative upper-to-lower-limit range of these uncertainties for a standard climate response of 2.5°C warming for a CO2 doubling is on the order of 40 percent of the standard scenario for the next 20 years, then increases to 50 percent and greater for the 2020 to 2050 and 2050 to 2100 periods, and beyond. 2000) over multiannual timescales. If soil and litter respiration rates are indeed independent of global warming, then carbon loss from litter and soil would be suppressed and allowed carbon emissions could be higher (row "temperature independent soil respiration rates"). Uncertainty in ocean circulation, represented in the Bern CC model by varying the ocean mixing, is also substantial, though not as great as uncertainties in land processes. Uncertainty in climate projections also translate into uncertainties in estimated carbon emission allowance. The climate feedback rows vary the equilibrium temperature for a CO2 doubling from its standard value of 2.5°C to 0°C in the no climate feedback case and 4.5°C in the high climate feedback case. Projected temperature and precipitation changes affect photosynthesis and soil respiration rates on land and the solubility of CO2 in the ocean. Climate change also affects vegetation dynamics, leading to forest expansion in high northern latitudes as well as to forest dieback in other regions. The results obtained with the three-dimensional Hadley and IPSL models summarized in Table 4.4 give another illustration of the climate feedback effect. Here the carbon emissions are fixed per the IPCC IS92a (Hadley) and A2 (IPSL) scenarios, and the models predict the resulting CO2 in the atmosphere. The Hadley model land biosphere, which suffers from a massive loss of soil carbon in the climate feedback case, shifts from being a large net sink to a large net source when climate feedback is added. As a consequence, atmospheric CO2 climbs to almost 1,000 ppm from the non-climate feedback result of702 ppm. This represents a difference of almost 600 PgC in the carbon sinks between the two cases. By contrast, the IPSL model, which is more similar to the Bern model in its behavior, shows a difference of only 160 PgC in the carbon sinks between the two scenarios. As discussed in Chapter 2, there exist vulnerabilities and possible "surprises" that are not readily included in state-of-the art models or that are possible but not necessarily likely. For example, an uncertainty not considered in the projections presented by IPCC and shown here in Figure 4.9 and Table 4.3 is the possibility of a collapse of the North Atlantic Deep Water formation and its impact on oceanic and terrestrial carbon uptake (see also Joos and Prentice, Chapter 7, this volume). Since the detection of rapid abrupt climate change in Greenland ice cores, European lake sediments, and sediments in the deep Atlantic (Oeschger et al. 1984; Broecker et al. 1985; Clark et al. 2002), concerns have been expressed that the formation of North Atlantic Deep Water may cease in response to global warming (Broecker 1987; Manabe and Stouffer 1993; Stocker et al. 2001). This would imply reduced ocean heat transport to the North Atlantic region with large consequences for the climate in Europe and the Northern Hemisphere. Model results suggest that the meridional overturning circulation may be vulnerable to future changes in the hydrological cycle and in sea surface temperature (Cubasch et al. Note: The IS92a emission scenario is applied in the Hadley simulations, and the SRES A2 scenario in the IPSL run. response to anthropogenic forcing (Stocker and Schmittner 1997), similar to what happened frequently during the last glacial period. However, since such ocean circulation changes, and in particular large-scale reorganizations, are highly nonlinear processes involving thresholds, there are inherent limitations to the predictability of such phenomena (Knutti and Stocker 2002). Sensitivity experiments carried out with dynamical ocean-biogeochemical models (Sarmiento and Le Quéré 1996; Joos et al. 1999; Plattner et al. 2001) show that a collapse of North Atlantic Deep Water formation has the potential to substantially reduce oceanic carbon uptake as surface-to-deep mixing is slowed considerably on century timescales (Figure 4.10). Figure 4.10. Impact of a possible collapse of the formation rate of North Atlantic Deep Water (NADW) on the oceanic carbon uptake, and hence the carbon emission allowance to meet a stabilization target (Joos et al. 1999). 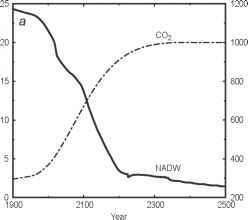 (a) Prescribed atmospheric CO2 stabilization pathway (WRE1000) (dashed, right-hand scale) and the modeled decrease in NADW formation under global warming (solid). (b) Oceanic carbon uptake is reduced for the simulation with global warming and a collapse in NADW formation (solid) compared with a simulation without global warming (thin solid). The contribution of various mechanisms to the overall reduction has been quantified by additional simulations and is indicated by arrows. Only the reduction in carbon uptake due to the effect of sea surface warming on the CO2 solubility (difference between thin solid and dash-dot, "SST" ) has been included in the IPCC projections. The slowed surface-to-deep ocean exchange leads to a further reduction in oceanic carbon uptake (difference between dash-dot and dash, "circulation"), whereas a more efficient nutrient utilization slightly enhances uptake of excess carbon (difference between dash and solid, "biota"). not fully account for the vulnerabilities of carbon reservoirs discussed previously and in Chapter 2, most of which are positive feedbacks. Another reason is that current terrestrial models (Cramer et al. 2001; McGuire et al. 2001) include relatively strong sink mechanisms driven primarily by CO2 fertilization. A strong sink mechanism is consistent with the traditionally high land-use emission estimates (Fearnside 2000; McGuire et al. 2001; Houghton 2003) and the contemporary carbon budget (Chapter 1). If land-use emissions (Archard et al. 2002; DeFries et al. 2002), and thus the present terrestrial sink processes, are overestimated or if the sink decreases in the near future (Hurtt et al. 2002; Cowling and Field 2003), this would have by far the largest potential impact on emission allowance of all the processes considered (Table 4.3). Yet another reason is that additional warming by non-CO2 GHGs, not included in the IPCC stabilization pathway calculations (Prentice et al. 2001), would likely lead to reduced ocean and terrestrial carbon uptake (Joos et al. 2001). In summary, there exist a broad range of uncertainties in the projected emission allowance for a distinct CO2 stabilization pathway. The impacts of these uncertainties on estimates of the cost required to close the gap between no climate policy scenarios and stabilization pathways and on optimal hedging strategies need yet to be explored and is a task for future research.